Alain is the legendary free-climber and human Spiderman. 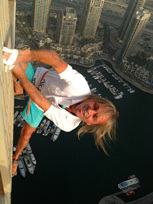 Alain is famous in hundreds of countries for managing to climb 141 of the world's tallest buildings with his bare hands. Alain is a legendary free-climber, referred to as the hymn Spiderman. He has thousands of YouTube hits that have amassed millions of hits each. Alain has achieved global success in free-climbing despite a career ending injury at 19, leaving him 66% disabled. Alain also, shockingly, suffers from vertigo, yet he preserves on with his passion. 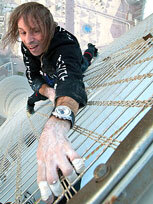 ’Spiderman’ Alain Robert is one of the most famous men on earth. His legendary feats, climbing 150 of the world’s tallest buildings 'with his bare hands' have brought him celebrity status in 150 countries. If you Google search most 'Hollywood A List' movie stars you get between 15 and 40 million results (Russell Crowe 19 million, Sylvester Stallone 18 million, George Clooney 39 million, Liam Neeson 16 million, Arnold Schwarzenegger 40 million). The Dalai Lama returns 29 million...but if you Google search Alain Robert you get 90 million results (Dec 2016). Motivational and Key Note Speaker - These days, Alain is fast becoming one of the world's most inspirational and compelling 'Motivational, Keynote, Risk and After-dinner' speakers too; having given talks internationally for a number of global corporations. His amazing life story is truly inspirational. In 1982 aged 19, he was a famous climber in France, regularly featuring on the covers of its national magazines. Then a major fall that year, while assisting a group of young climbers, left him with many broken bones and in a coma for 5 days. After months in hospital undergoing extensive surgery, his surgeon Dr Hoel, who was a climber too, told Alain he would never climb again. He said in all his years he had never seen such shattered hands. On leaving hospital Alain returned to his hometown. His career was in ruins. In fact, he was so weakened from his many injuries that he could not even lift up a cup of coffee. As a consequence of the fall he was left permanently 66% disabled and suffering from vertigo and epilepsy too. However, after two weeks back at home feeling sorry for himself he decided he just had to do something to help speed up his recovery. He figured that if he had 34% of his body still functioning, then he was determined to try to get the maximum from it. The Wall - Near his home Alain found a wall. It was only 3 meters [10ft] high, but it was more than 250 meters [800ft] long. His plan was not to climb up the wall, but to climb across it. For the first couple of months all he could do was go to the wall and lean against it. Nevertheless, he continued visiting the wall four times every day ‘just to lean against it’. Eventually some strength began to return and he was able to move his hands on the wall. Each time, he would mark the point he had reached with chalk. His plan was to keep pushing a little further, then further. Although he continued to visit the wall four times every day, it nevertheless took him two years to finally make it all the way across its 250 meters width. In those two years he had made around three thousand trips to the wall. Incredibly, after all this and despite of his disabilities, his phenomenal perseverance had turned him into an even better climber than he was before his accident. Alain was able to return to free-solo climbing mountains, cliffs and gorges. Then in 1995 in the USA he climbed his first skyscraper for a television commercial made for Sector Watches. Alain has since gone on to climb 150 of the tallest buildings on earth, with nothing more than his bare hands and a little chalk-dust. In a sport where few climbers become famous and none make any real money, Alain’s heroic feats have not only made him wealthy, they have also raised him to international celebrity status. His friends and fans include members of royal families, sheikhs, world leaders and celebrities. Climbers worldwide acknowledge him as being the greatest climber who ever lived, and the incredible Alain Robert has now been included in the World Hall of Fame of Top 100 athletes all time. Others in the list include Jesse Owens, Muhammad Ali, Michael Jordan, Pele, Mark Spitz, Maradona, etc. His ascent of the National Bank of Abu Dhabi attracted 150,000 spectators and was shown live on TV. When he was engaged by the Russian Government to climb Moscow State University, in celebration of the city’s birthday, he was watched by 100,000 live spectators and shown live on TV. Several of his climbs have attracted more than 100,000 live spectators. His ascent of the Sapphire Mall, Istanbul, attracted around 300 TV / media crews and was shown live on 4 x TV stations in that region of the world. His 2015 climb of the world's tallest 'twisted' tower (Cayan Tower, Dubai) achieved unprecedented global media coverage. Alain’s episode of CNN’s ‘Revealed Show’ went to a world audience of 700 million and was repeated. His ascent of the world’s tallest building the Burj Khalifa, Dubai, in 2011 was global front-page news. Alain's ascents always become world news events. As a speaker, Alain Robert’s achievements and his incredible 'life and near death' experiences enthral audiences wherever he appears. Gasps of astonishment are heard as he describes some of his climbs and audiences invariably give the charismatic Frenchman standing ovations. Alain’s career is now being steered toward movies, with a life story to be called ‘The Wall’ – A Deadly Game of Skyscrapers, and a role in a James Bond 007 production. ‘Spiderman Alain Robert has reached way past his dreams’… He is a true living legend! History will recall him as a 21st Century global icon, ranking him with other greats of history like - Harry Houdini, Charles Blondin and Evel Knievel. His talks are fresh, exciting and truly inspirational.